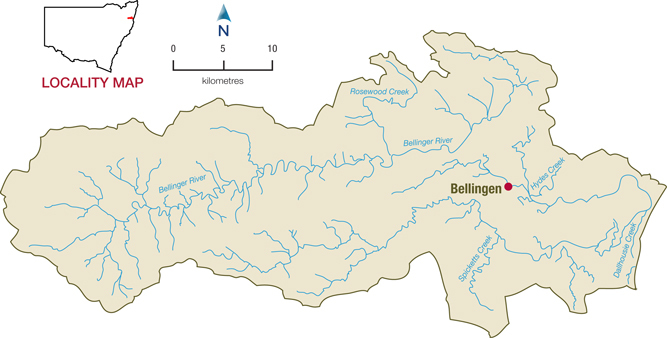 The Bellinger catchment is on the mid north coast of NSW. The catchment area is 1,000km2, about 70km long and 20km wide. Much of the area is mountainous with limited areas of flat land associated with river and creek valleys. Steep areas of the catchment are under forest cover, while the narrow floodplain and associated foothills have been cleared for grazing, cropping and other uses. 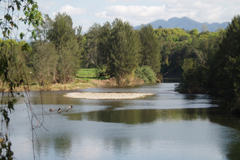 Located on the Mid North coast of NSW, the Bellinger river flows from Dorrigo Plateau through to the ocean at Urunga. Coffs Harbour, Nambucca Heads, Macksville and Urunga. Urban development is mainly limited to the small towns of inland Bellingen and coastal Urunga. Raleigh, Repton, and Myleston are smaller villages also on the coast. The Bellinger River rises in the Great Dividing Range and flows south-east through an extensive coastal floodplain to Urunga, where it meets the Pacific Ocean. Major tributaries include the Kalang River, and the Boggy, Woods and Hydes creeks. The tidal influence extends about 20 kilometres upstream of the Bellinger River, and about 25 kilometres upstream of the Kalang River. Major water users in the catchment include local councils, water utilities, forestry, conservation, livestock grazing (dairy, beef, pork), some irrigated crops such as maize, sorghum and vegetables. Other economic activities that occur in the catchment include fishing, tourism, oyster and fish farming. The Bellinger catchment is highly valued for its natural beauty and contains some regionally significant rainforest. The valley is also famous for the Ringwood Tree and the freshwater turtle, Elseya georgesi, which are only found locally. Topography has been a dominant factor in development, with the steep areas remaining under forest cover while the narrow flood plain and associated foothills have been cleared for grazing, cropping and other uses. Most of the forest is contained in either national parks or state forest areas.